To some people, Sicily conjures up images of endless citrus groves and fields of olive trees, blood oranges and golden olive oil galore. To others, it may be all about the wines (especially dessert wines and fortified ones like Marsala) and the abundance of fresh fish. To me, as you know, it’s all about the sweets. I already plan on returning one day to experience those other delicacies too – notably the wines and the island’s king of fish, swordfish… when I’m not 6 months pregnant ! 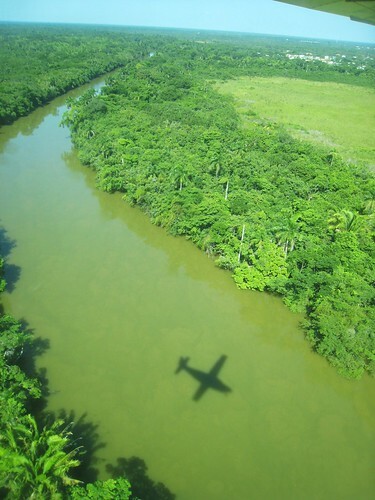 (How’s that for a surprise – and total disclosure ?!) Thankfully though, gelati, granite and marzipan are not on any lists of foods to avoid. And Sicily is truly a heavenly place for us sweet lovers. Let’s put it this way, ice cream sandwiches (literally, ice cream in a sandwich) are a way of life; and brioche dipped in sweet, icy granita is common for breakfast. As a non coffee drinker, it’s rather surprising how much caffeine I consume in Italy. 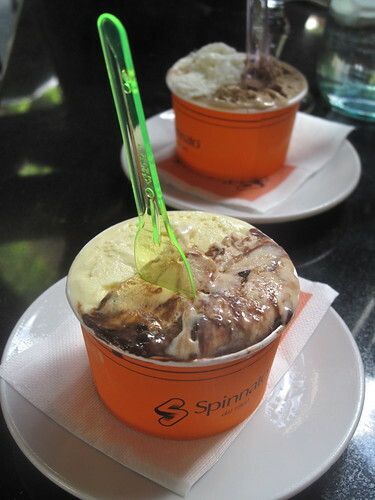 But when it comes to gelati and granite, coffee shines. 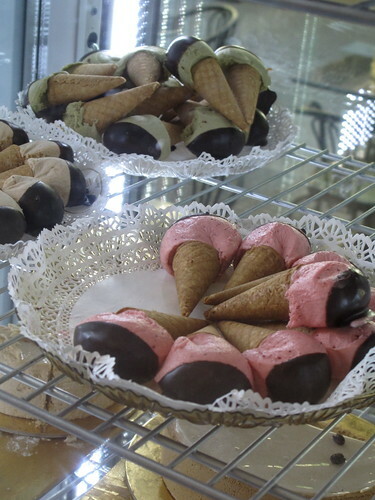 Dolceria Costanzo is arguably where you’ll find Sicily’s best gelato. And I went there with my heart set on discovering that for myself. 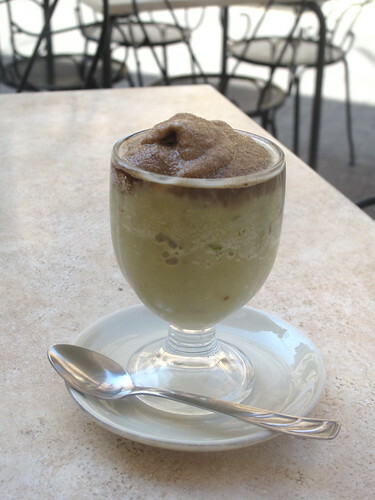 But with one taste of their cold, coarse coffee granita, I was already in heaven – and forgot about the gelato. 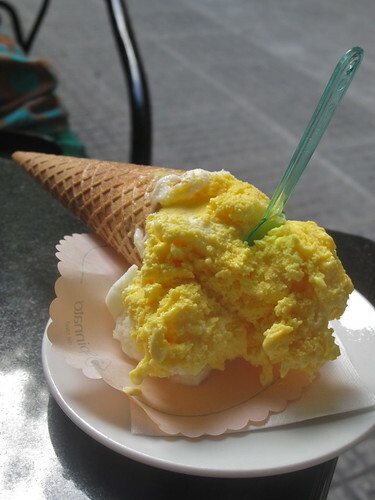 I can’t imagine any sweet being more refreshing and satisfying on a hot, sunny day in Italy. 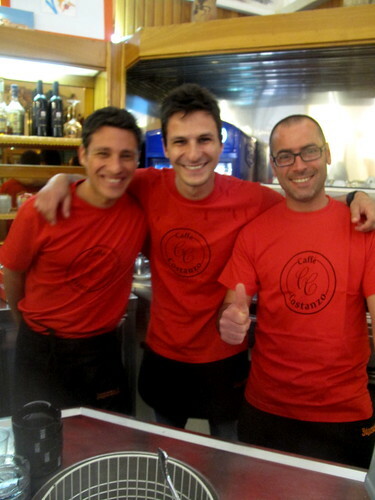 The very friendly boys at Costanzo (Davide, Daniele and Roberto, below right) gave me a taste of almost all of their granita flavors, including the seasonal gelsi (mulberry/blackberry) and pistacchio, a winner in my book. If it’s hard to imagine pistachios and ice (and a lot of sugar) being one – and being divine… all I can say is that it’s worth the trip to Noto to see – and taste – for yourself. 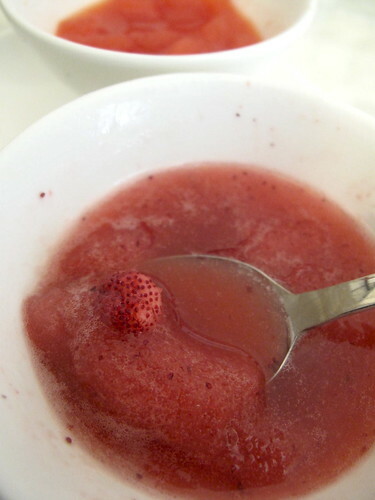 Granita ? in Noto ? How could I not mention Caffè Sicilia ? There are reasons it’s on every Sicily traveler’s radar. 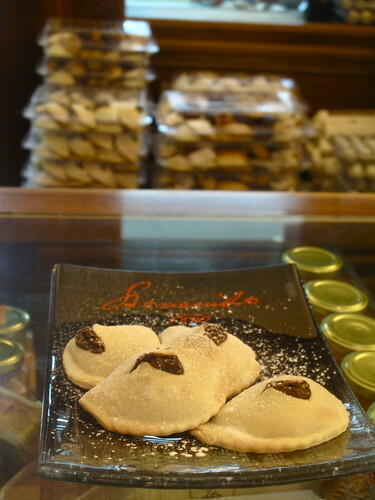 A history dating back to 1892 and boasting one of Italy’s best pastry chefs are two of them. 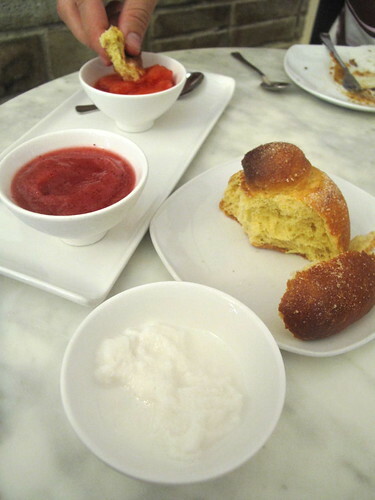 I’d say Corrado Assenza’s brioche is the third reason. 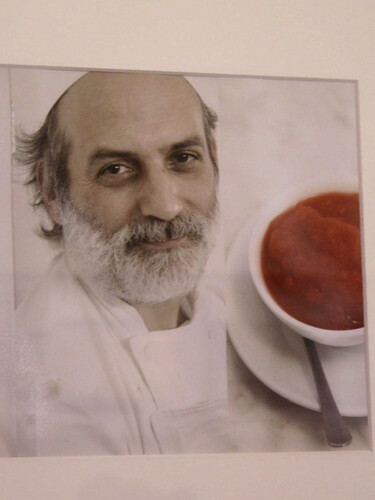 Assenza (in the photo below) has quite the reputation for his unique combinations of ingredients and using only the freshest of the local crop. If his gelati names seem ordinary, just know that the chocolate flavor has lemon rind and ginger in it, and the orange flavor has wild fennel, olive oil and onion in it ! As for his granite, they make a singular ingredient shine, no sweet or savory surprises here. Wild strawberry, blood orange or the region’s famous Noto almonds, it’s a cold burst of flavor in every spoonful. As much as I enjoyed the granite, I’d go back for the brioche alone. Key word, “alone” (the brioche, not me). 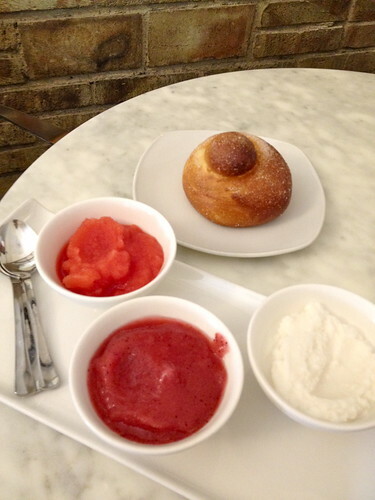 The locals at the tables around us chatted away in sing-song Italian, while dipping their airy brioches in granita, but I personally preferred them eaten separately. 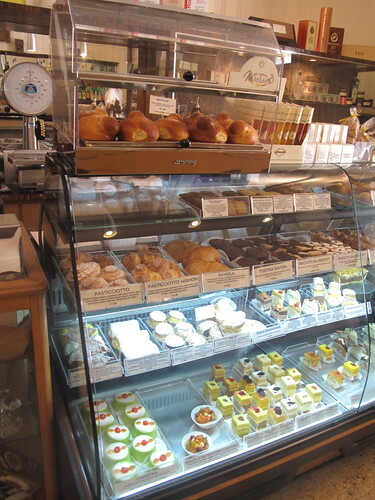 Below the tray of brioches at the entrance to the shop is an equally tempting selection of cannoli, individual tarts and desserts. I spent more time deciding between the different varieties of torrone, which have all miraculously traveled back to Zürich with me… unopened. Oh, and be sure to look up at the ceiling, the chandelier is worth seeing (below). Hint: it’s not crystals or bulbs, but tubes of honey. 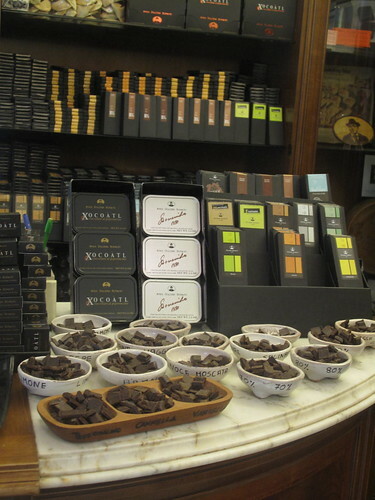 If you’re in Sicily and you’re a chocolate lover, a pilgrimage to Modica is a must. 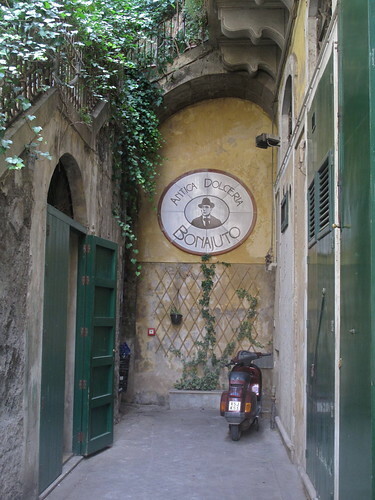 Antica Dolceria Bonajuto is the oldest chocolate factory in Sicily, in production since 1880. 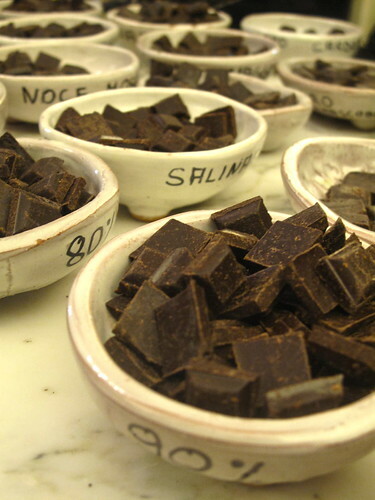 Modica chocolate has a unique texture, using traditional Sicilian methods of heating cacao only up to 45 degrees Celsius instead of 90. In general, we are more accustomed to eating chocolate that has been conched, its sugar crystals have dissolved, and it gives us that ‘melts in your mouth’ unctuous taste experience. 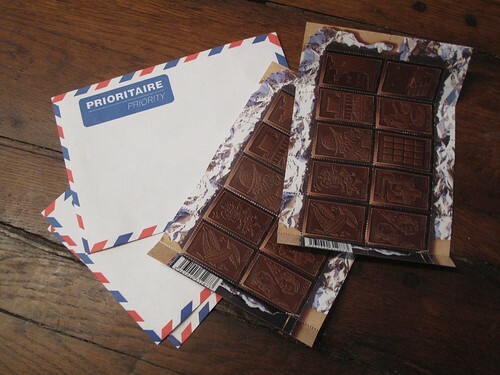 Not so with Modica chocolate. 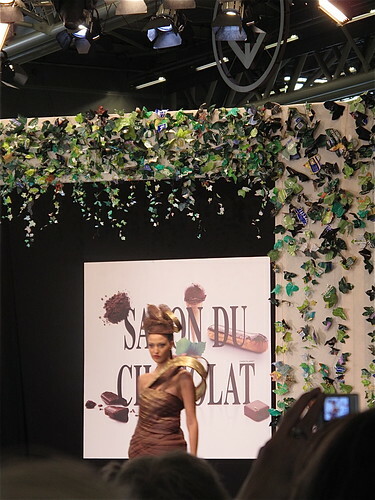 You appreciate it for its more “pure” state and the cacao beans’ aromas that have been preserved (Bonajuto’s beans come from West Africa). 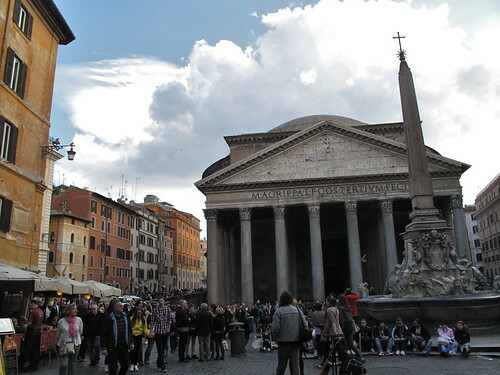 The shop is in a tiny picturesque alley facing the Chiesa Madre di San Pietro. Inside you can follow the Bonajuto family history, watch a video shot at their cacao plantations and especially taste a square of each of their varieties – different percentages or spices and fruits (orange, lemon, salt, marjoram, cardamom), and the one that stood out for me, vanilla. 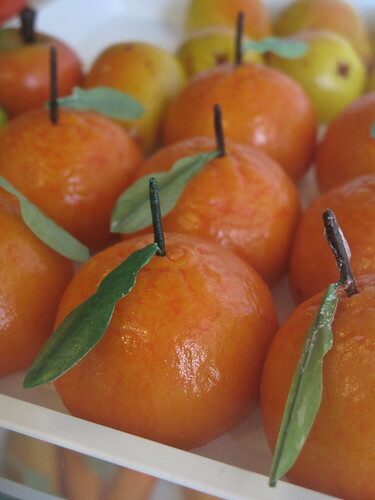 I recommend tasting their marzipan stuffed olives and their mpanatigghi as well, both examples of sweet meets savory. Mpanatigghi are pastries made with chocolate, ground almonds, spices and…veal. The poor girl who tasted one while I was there and then asked what it was, only to reveal thereafter that she’s vegetarian (oops !). 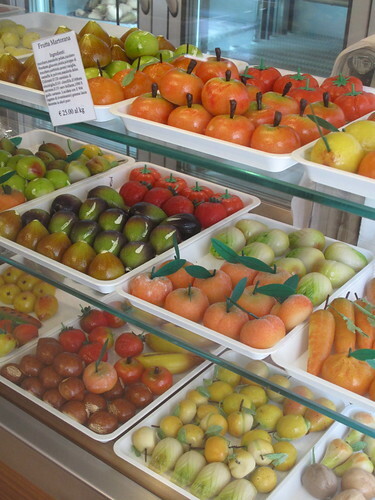 Throughout Sicily, especially Palermo, display cases of fruits and vegetables in the most vibrant of colors and the most perfect of forms can be found. The incredible details on these little pieces of art are impressive. Even more so when you consider that they are not much more than almonds and sugar. 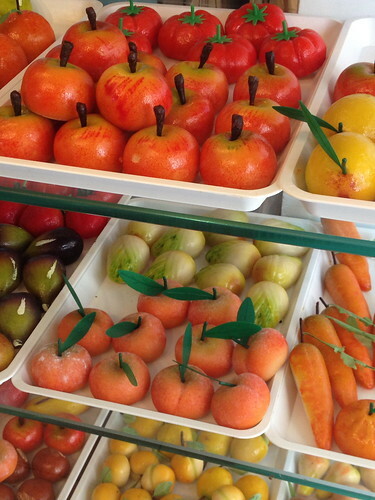 In Modica, a city known for its chocolate, this rainbow of a display caught my eye, and the shopkeepers let me simply ogle the trays and trays of glistening frutta martorana (also known as pasta reale) with wide eyes and an open mouth. Katie Parla tells us about the history of these almond beauties from Palermo, and Fabrizia Lanza shares her recipe. 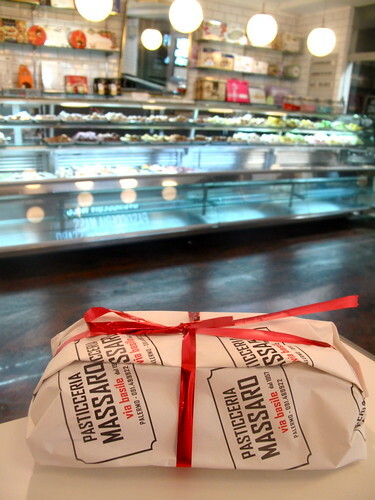 Massaro is definitely an address I hope to return to, for the bright pastry shop with an absolute plethora of sweet choices – mini cakes and cookies and stunning marzipan fruit and vegetables, almost too pretty to eat. 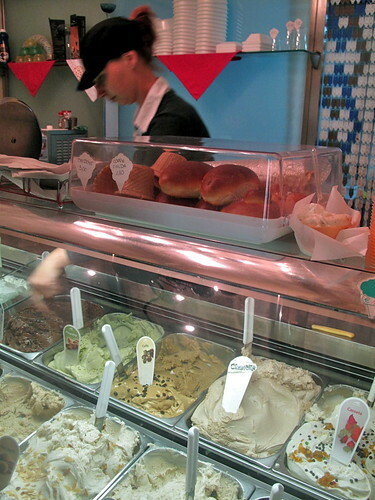 The Massaro gelateria across the street is just as tempting, with lines out the door and just about everyone walking out with a soft brioche exploding with heaps of gelato. (A stellar flavor was pistachio chocolate swirled together as one). Best of all was their mini Cassata Siciliana, a classic Sicilian dessert, interpreted differently by just about every pastry shop on the island. Everyone seems to agree on the sponge cake layers soaked in liqueur, the filling of rich, sweet ricotta, oftentimes dotted with mini chocolate pieces, encased in green colored almond paste, topped with sugary icing and always finished with gorgeous candied fruits. It’s pretty much the flavors of Sicily’s best known desserts in one. This one was bite-size, incredibly soft, and sweet without being cloying. Enoteca Il Barocco, Ragusa. 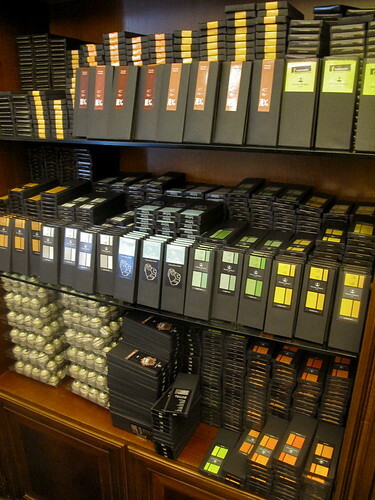 Among the shelves filled with bottles of wine, bright green shelled pistachios and savory spreads is a wide selection of brands of Modica chocolate and carob bars. Gelati DiVini, Ragusa. No tasting for me (see disclosure in opening paragraph), but certainly a unique list of gelato flavors at this tiny shop, specializing in wines and liqueurs – in their gelati. 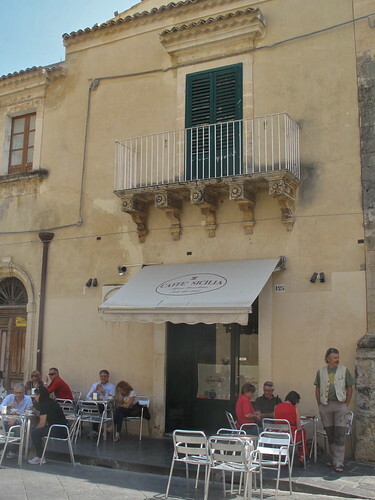 Caffe Pasticceria Marciante, Siracusa. I nearly walked right by this shop, but the trays and trays of cookies in the window stopped me in my tracks. Antico Caffè Spinnato, Palermo. Looking for a sophisticated, posh café address in the new quarter of Palermo ? This is it. The gelato was a standout for me and my friends, who all melted over the flavor, Sette Tentazioni (below left), a take on the signature cake made with seven different forms of chocolate. 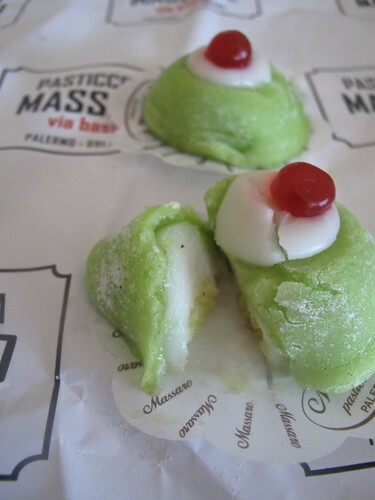 What are your favorite sweet addresses in Sicily ?? Mmmhhh, what gorgeous treats! Really droolworthy. I looove Sicilian pastries ! I remember of a wonderful trip around Sicily, stoping at each pasticceria in every city… (especially at Taormina and Erice) … Thank you for this post!! What a load of sweets you have here. I can’t fathom eating it all. Well… yes I can. 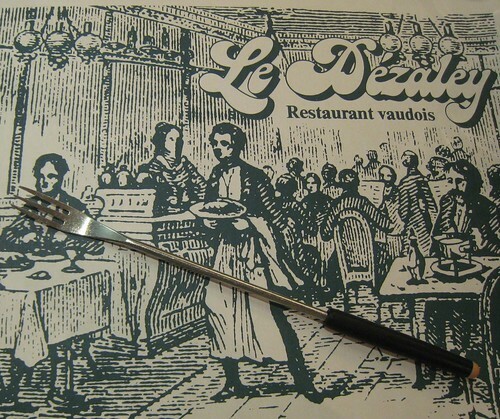 I’m very interested in the veal pastries, and the marjoram chocolate. And the honey chandelier, how cool! Jack, yeah that almond granita was really special, unlike anything I have ever tasted before. Unfortunately, I wasn’t able to bring back any granita for you, but Sicilian olive oil, SI ! 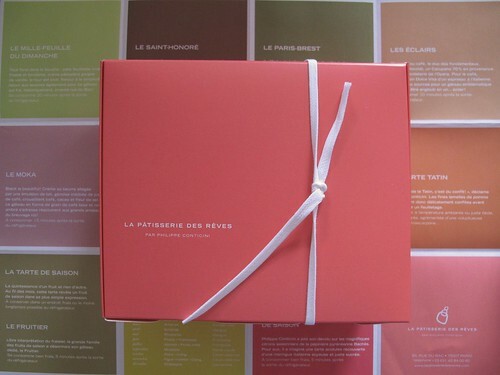 Raids Pâtisseries, mais de rien ! 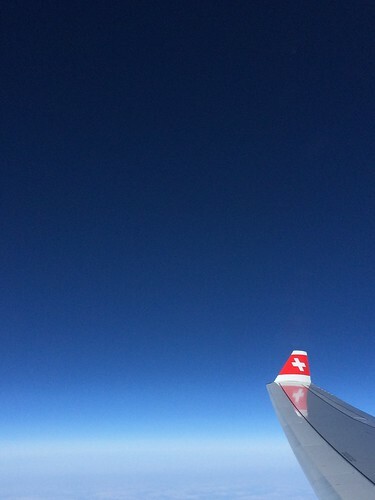 🙂 And we certainly travel the same way, stopping at every pastry shop – a must for any visit anywhere ! Merci pour le commentaire ! Emma, “a wee KugelCutie in the oven” =))) You bet ! Let’s just hope this baby likes sweets, haha ! And I know you can certainly fathom eating all these sweets – and would be able to eat them all with me too ! 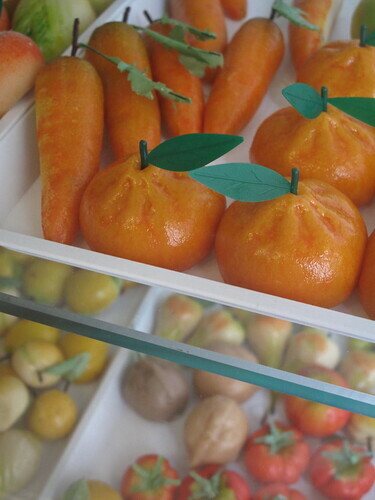 I am such a sucker for marzipan fruit. It’s so darned cute! You are making me excited for our upcoming trip to Sicily next month. thanks for the tips. Oh, I so have to go there. Thank you for mentioning my family’s namesake. Noto. While my grandparents lived in Polermo, someone way back came from Noto (hence our last name). Someday I will get a chance to see it and visit. 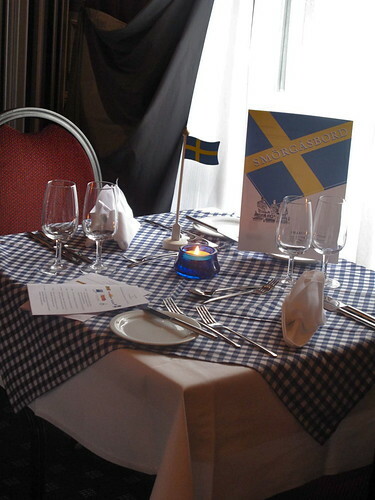 Now I have places to try when I am there. Thank you! Marsala is not really a drinking dessert (sweet) wine, it is used in cooking to make sauces etc & can be used to make Italian desserts such as zabaglione & tiramisu, it’s more like port which is fortified wine. OK yes you can drink it with dessert but it’s not normal and on your link it says this…..feel free to drink it warm! kelleyn, how perfect, your sweet travel guide right here ! Enjoy a taste of everything for me again ! Debbie, you’re very welcome. I hope you can return soon to your roots and explore your family’s history, as well as all these sweets ! Fergus and Goetz, thank you both for your wine comments, a subject you both know way better than I do. My mistake though for categorically calling Marsala a dessert wine. “Fortified” is definitely the right word (and I will make that change above pronto), even if it can be drank sweet too. Grazie to you both ! Et moi qui pensais qu’en Sicile il n’y avait que de la mozarrella… je vais y aller rien que pour le massepain, j’adooooooooooooooooore ça!!!! you’re such a traveller and your Sicily post is a stunner – I just wonder how you could eat all those lovely sweets (and this from a non dessert person!!! but I LOVE their coffees and granito, cannoli, brioches etc etc…. I don’t care for the Italian bread though… and the espresso (or just caffè in Italia) I learned to enjoy when staying for hols in Italy…. THAT is so much better than Marsala – and I had M lukewarm, cold, even chilled, but it’s true, Marsala has a reputation as a ‘cheap’ cooking wine for desserts and the non-distinguishing ‘wine’ drinker. More sophisticated lovers of dessert wines go for the Vin Santo. 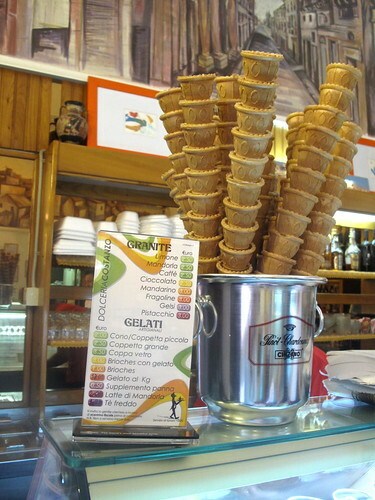 The bestest ice creams I ever had in Switzerland, France and other countries, were always coming from Italian ‘sources’. You might know the Gelati Venezia? 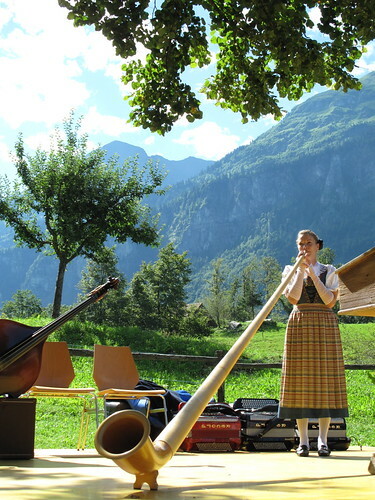 They have those little carts on wheels and have their place in Lutry, Lausanne OUchy, Vevey, Château Chillon and more…. Ab-so-lu-te-ly fabulous! And only about 25 different varieties! i admit there is a wide spread (mis-) conception that marsala is only for cooking and vin santo is better…. but as you guessed, it is, objectively, not true. marsala, obviously not the 3 euro bottomshelf version, is a very good wine, different and more versatile than vin santo. it can be drank as is (chilled), with blue- or other strong cheeses, with creamy desserts (like cannoli)….. it is officially a fortified wine wine, bur calling it a dessert wine is not a terrible crime. good marsala is not cloyingly sweet, has retained freshness and an almost salty note. they can also get very old, the oldest i tasted was from 1932. Kiki, merci viel-viel-vielmal ! =)) Nothing to fear, only a big smile from ear to ear at your sweet, touching words. Thank you ! I don’t know much at all about wines, be it Marsala or Vin Santo, but I’ll take your advice on both… for after the baby is born, of course 😉 And I do recall you telling me about Gelati Venezia, gotta try that one day. Wine’s not my thing, but ice cream – you bet ! Hi I found your blog through a link on facebook. I love Sicily , have only been once but it was so worth it. I have a good friend who lives in Modica and she said the Chocolate Festival is fantastic. Wow, big news! Congratulations! This is very exciting. But selfish as I am, I thought for a tiny instant ‘oh I really hope she will keep on posting after the birth…’ Sorry to be so selfish…I love your posts and it always makes me really happy to look at your gorgeous pictures! There is something about your photography that I just really really love! I have never been to Sicily but I would love to go one day and check out all those lovely places you mention. 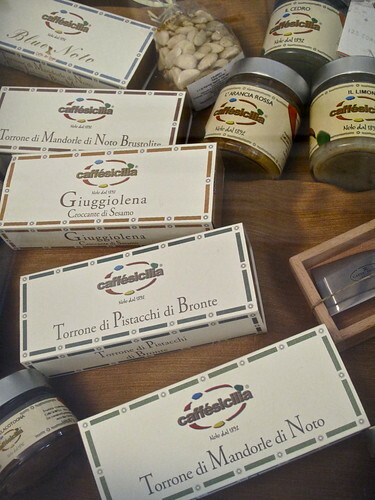 When we visited Sicily, we drove out to Castelbuono – there is a wonderful place there – i fratelli fiasconaro – that makes the best soft torrone I have ever had. They have some wonderful jams, gelato, and other sweets, as well. KEERRRRINNNN!! OMG OMG! I was totally distracted by your exciting baby news to read about your sweet Sicily. Congrats to you and Olivier!!! OMG!!! What….you are pregnant!!! You didn’t tell me! Thank you for sharing this extraordinary trip to Sicily with us. I wish that I could have been there tasting every single item that is photographed! I just love the marzipan windows, the coffee granita, pastries. I really can’t decide what I would taste first. I want it all! The ice cream sandwiches with a great cup of expresso would just be perfect right now. I’ve actually had to make notes as I read the post. ; o ) Now, ice cream sandwich. I have to confess not being attracted to it. Makes me think of soggy bread. Is it unfair? Loved the idea of good coffee ice cream. I do love coffee but good coffee which unfortunately is a rarity in the UK. 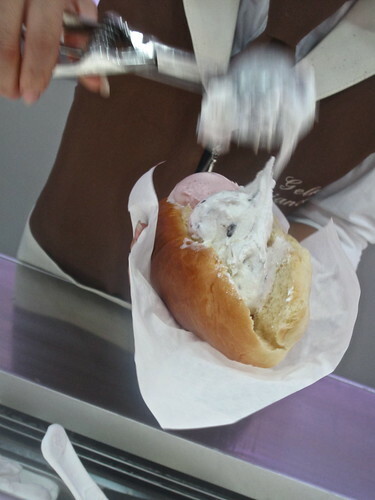 Dolceria Contazo is on my list for a future visit to Sicily. What about this pistachio granite – it has got me very curious. I just adore pistachio but have only ever had ice cream. 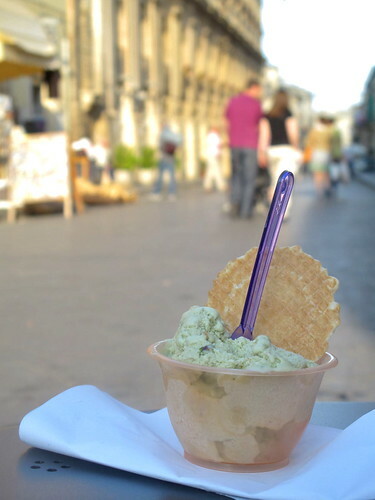 Beautiful pistachio ice cream in Rome and Florence. Absolutely loved the idea of dipping brioche in granite. What a cool idea! 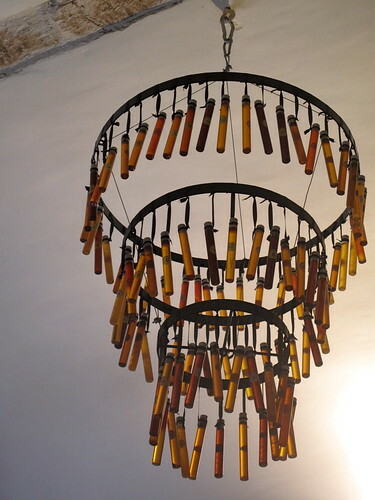 And creativity reigns in the form of the honey bottled chandelier. 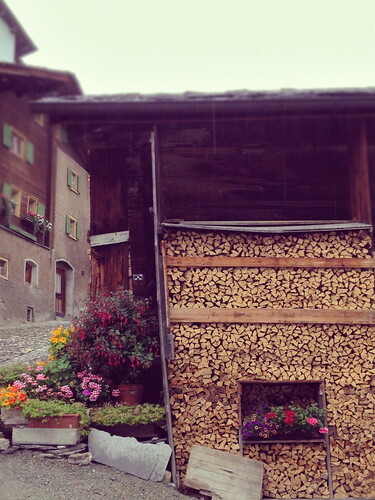 Quaint shop entrance to the dolceria, hey?! The fruit is perfect. I’m just blown away by them. Have to come back to this post and read some more at a later stage. Can’t take it all in. ; o ) I have no idea how I missed this post. So glad I checked yours posts again. Unfortunately having never been to Sicily myself I cannot share an address with you. You CAN get wonderful coffee in UK – head over to CAFFE NERO, they are PERFETTO!!! Hi Kiki, how sweet of you to reply. I do not like Nero or Costa coffee I’m afraid. So agree with you on ‘B’ place!! The Nero and Costa branches I have been to are disappointing. Don’t take me wrong – you can get good coffee in the UK but not as easily as you do in many other European cities and I do not like being served a latte when I order a cappucino which often happens to me. I’m really particular about my coffee spots . Once again, many thanks. Just discovered your blog! love it so far! We were in Sicily earlier this year and I am glad to see that I am not the only one that dragged my travel companions (somewhat obsessively) to all the famous pastry shops! The Antica Dolceria Bonajuto was definitely an interesting experience, the texture of the chocolate was really one of a kind, but i think i went overboard with buying mpanatigghi and other things to bring back. While they were all unique and good, I realized I could live without them. The Dolceria Costanzo had sadly just closed for a mid day break and we only got to try Caffè Sicilia (twice in fact, because it was so good!) The flavor combinations really are a delight (basil gelato and almond/lemon gelato). That and a pistacio gelato we had in bronte were really the best I have ever tasted. 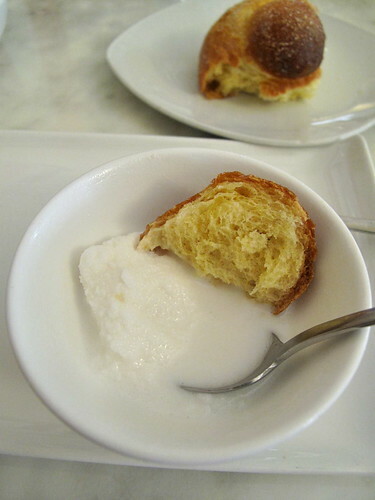 I also found the combination of brioche and gelato a bit off putting. Why mess with 2 things that are wonderful on their own? For that ice cream alone, I would go back to Noto! 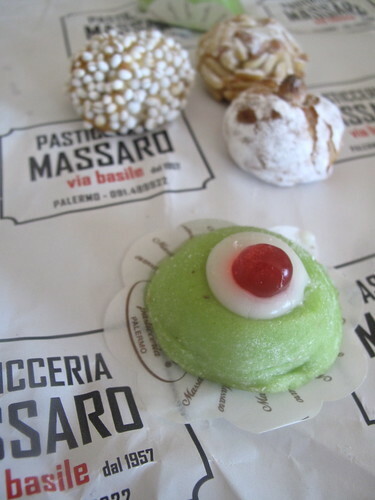 As for Marzipan sweets, I thought those at the pretty well known Pasticerria Maria Grammatico were all WAY too sweet, and the different varieties tasted more or less the same. The best ones we had the whole trip were in Palermo at the Pasticceri Capello. Palermo was our first stop, and by the end of the trip I regretted not having bought more to take home there. Kerrin, this definitely is mouth watering! 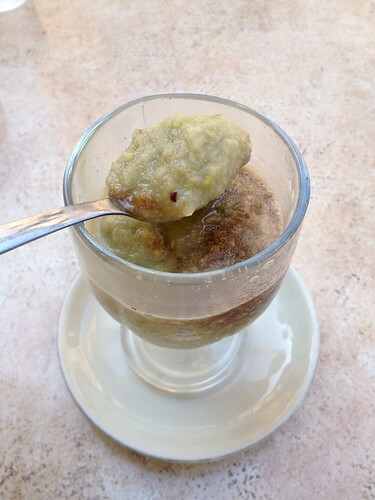 Cornetto and Cassata are really tasty icecreams, but the granita caffe is incredible….